Believe us when we say that we’ve dealt with our fair share of ambitious, DIY-driven homeowners. Really, we don’t blame them for attempting to tackle all things home maintenanced-related on their own — after all, every homeowner should take great pride in their place of living. However, when it comes to navigating a situation like roof algae removal in Seattle, some things are simply better left to the professionals. Admittedly, a source like “RoofMoss.com” is going to be biased when writing about who to contact for quality roof moss treatment services. At the end of the day, it’s completely up to you if you want to climb on top of your own roof in an attempt to remedy your mossy situation. However, our team of roof algae treatment professionals (note: to avoid confusion, “roof moss” and “roof algae” are referring to the same thing!) would like to present a few more-than-valid reasons as to why Pacific Northwest homeowners should work with us and save the DIY-projects for other endeavors. 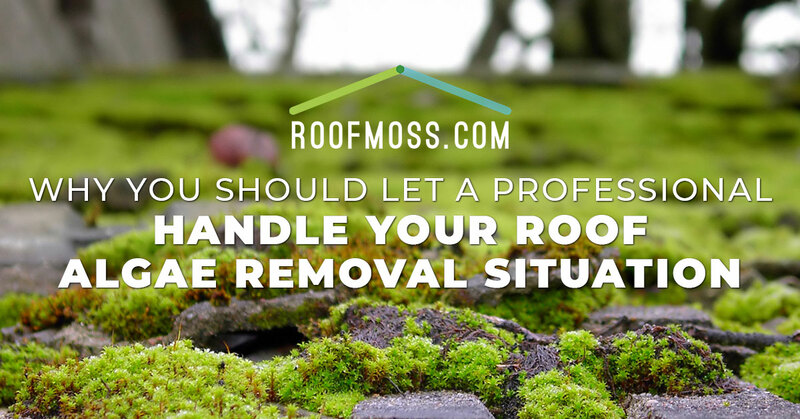 So, without further ado, continue reading below to learn more or feel free to get an instant estimate if you’re already convinced that RoofMoss.com is the trusted and effective way to go. We’re not saying that you’re automatically going to injure yourself when climbing on top of your roof, but we’re also not recommending that you do so. Getting on top of a roof means subjecting yourself to considerable heights, a situation that could very well lead to injury should you accidentally lose your footing and fall. When you combine sponge-like roof moss with the wet conditions that the Pacific Northwest is often known for, that’s a slippery slope (literally) that you really don’t want to deal with. Sure, you can attempt to scrub away the moss on top of your roof on your own while saving money in the process, but can you really rest easy knowing that you did a good, thorough job? By hiring our professional roof algae treatment services in Seattle, homeowners can trust that we’re removing all traces of moss on top of their roof, ensuring that it’s not going to grow back anytime soon. What’s the point of doing an incomplete job even if it saves you a few bucks? If you’re following some random online tutorial about how to clean your roof using dangerous chemicals and harsh abrasives, you could be causing your roof more damage in the long run than anything else. At RoofMoss.com, we use eco-friendly, safe roof algae removal methods that won’t compromise or harm your roof in any way. Why put the most important part of your shelter at risk? Take Control Of Your Roof Algae Situation Today! Don’t put you and your roof in harm’s way. Instead, protect your home’s most valuable structural asset by contacting the Seattle roof algae treatment experts today.